Emily is the new girl at school. She learns quickly that her first day at a new school isn't going to go the way she expected. She gets teased about her appearance among other things. At first, Emily thinks that there is something wrong with her, and wonders if there is something she can fix about herself to get the other kids to stop teasing. She soon learns that the problem isn't her, it's them. Together with some new friends that she initially overlooks due to her worries, they bring about change at their school with confidence, communication and teamwork. 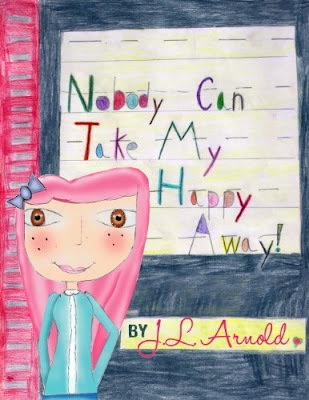 This book is written by Jessica Arnold, the author of "I am Good at Lots of Things" and "Hello My Name is Rose and this is My Christmas Story"
"Nobody Can Take My Happy Away" is inspired by her own real experiences. Jessica communicates her feelings with this story about how she got her "happy" back and her confidence.